If you don’t like it, peg it your way! The idea of craftsmanship is not only a key component of the product’s process but it should also be represented in the interior design as a way of crafting the space. The idea of a unfinished space, a process in continuous transformation, a process powered by human interaction and craft is well perceived by the state of materials onto where you can see the projection of handmade texture– the perfect imperfection of human hand. A wall system with unpolished aspect given by the concrete panels and the unpolished wood cases would break the perpetual/everlasting notion of design. 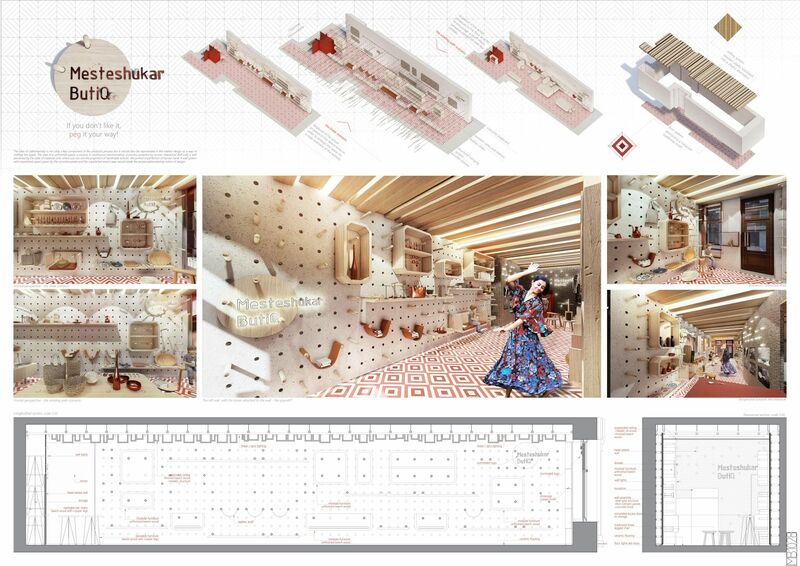 The store of Meșteshukar Butiq has the ability to bring together both the making and the designing into a single space of the synergistic creativity of Roma and Romanian cultures. Regarding this idea, the proposal is ought to be versatile depending on the event or necessity and various by the range of furniture modules and their way of display. 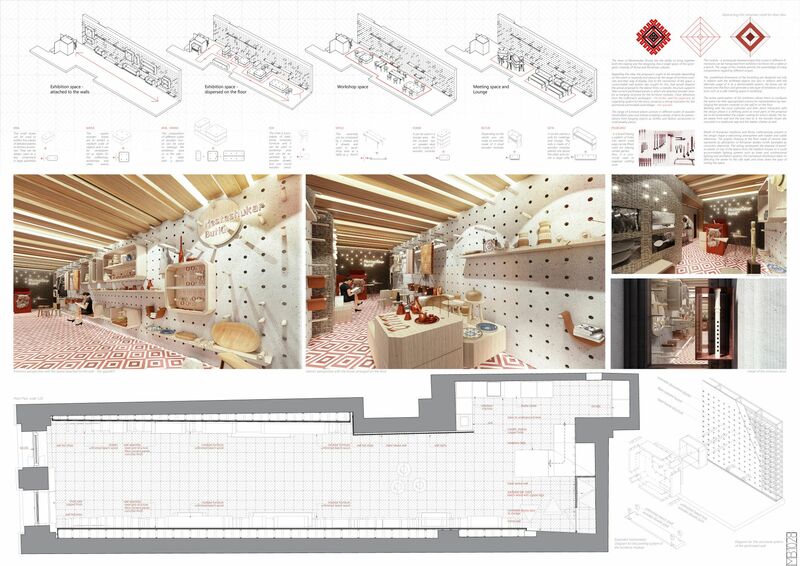 Due to the narrowness of the space, a customizable wall system was sought for this, that would disperse the actual proposal to the lateral limits: a metallic structure supports fiber-cement perforated panels in which are attached wooden dowels as hanging structure for the furniture modules. Close references from the craftsman’s workspace - the toolkit, and the pegboard, an organizing system for the tools, served as a strong inspiration for this permissive permutable assemblage – the spacekit. The range of furniture pieces consists in different scales of wooden handcrafted cases and shelves enabling a variety of items for presentations from hanging objects as clothes and fashion accessories to small jewelry pieces. The module - a rectangular beveled shape that comes in different dimensions can be transposed from exhibition furniture into a table or a bench. The usage of this module permits the assemblage of many compositions regarding different scopes. The predefined dimensions of the furnishing are designed not only in relation with the exhibited objects but also in relation with the alternate usage of it; as a demountable system, the boxes can be moved onto the floor and generate a new type of exhibition or functions such as a cafe meeting space or workshop. The active participation of the exhibitors allows them to configure the space into their appropriated scenery for representation by rearranging the wooden modules on the wall or on the floor. Working with the local craftsmen and their direct interaction with the design phase is a defining point as most parts of the proposal are to be handcrafted: the copper coating for entry’s details, the hazel weave front wall and the one next to it, the wooden boxes dry mounted in a traditional way and the leather shelves as well. Motifs of Romanian traditions and Roma craftsmanship present in the design shape a welcoming atmosphere with hidden and subtle references. The graphic drawing of the floor made of ceramic tiles represents an abstraction of Romanian textiles motifs translated by concentric diamonds. The ceiling reinterprets the disposal of wooden planks on top of the beams from the tradition houses so it could accommodate lighting systems such as linear and unidirectional lighting and ventilation systems; the transversal distribution relies on directing the viewer to the side walls and slows down the pace of visiting the space.